Total Guitar 266 is on sale in print and digitally now. This issue, we're looking at 20 guitarists who defined the Britpop era, with essential listening, gear and songwriting advice! As well this, we have brand new in-depth interviews with Noel Gallagher and Graham Coxon on their new albums. 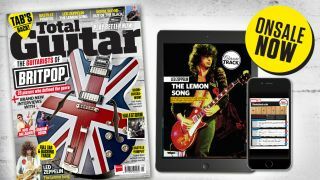 Song tabs are back in Total Guitar, and this issue we've brought you full transcriptions Led Zeppelin's 'The Lemon Song' and Bastille's massive hit single 'Pompeii', both with studio-quality playalong backing tracks. We also show you how to play Royal Blood's monster riff from 'Out Of The Black'. Elsewhere in the magazine, you'll find interviews with Halestorm's Joe and Lzzy. Prog wizard Stephen Wilson talks guitar tones, production and working with Guthrie Govan, and You Me At Six give us a detailed tour of their live rigs. Each month TG brings you the latest and greatest kit reviews. This month is no exception as we check out the Blackstar B.E.A.M, a trio of well-equipped affordable rockers from Cort, PRS' new low-watt, high-gain Archon 25, Electro-Harmonix's polyphonic Pitch Fork pitch pedal and loads more!